Tax Time is Now Savings Time in Arkansas! Back in October, we wrote about the need to save, specifically at tax time. Why? Because that’s the time that most Americans receive their largest lump sum all year. Combined with research that shows savings habits are stronger when money is immediately placed into a separate savings account, and the idea for “Add-A-Line” was born. Now, just six months later, we’re proud to announce that this idea is officially state law! 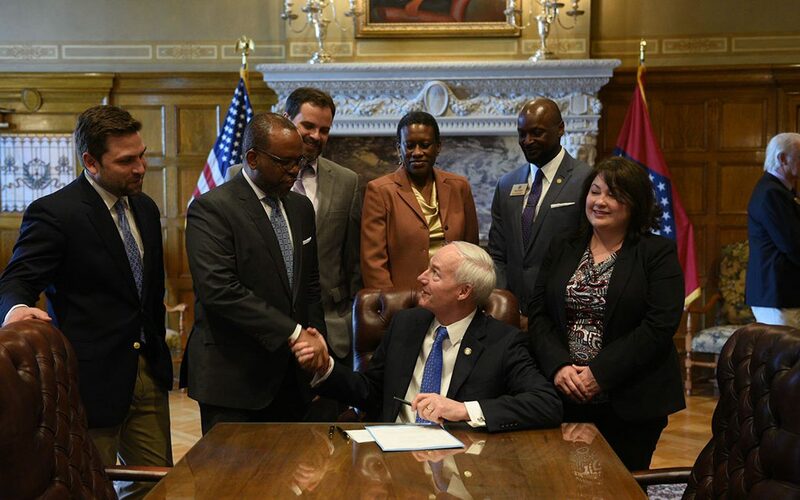 Yesterday, Arkansas Governor Asa Hutchinson signed into law Act 774 of 2019, which requires the state to add a second direct deposit line to income tax forms in time to file for the 2020 tax year. This innovative policy provides Arkansas taxpayers with a powerful new way to save. We won’t have to wait until the refund hits our account to send some to savings (or more likely never get around to sending it to savings); instead part of our refund can automatically go directly to our savings accounts. Our behavioral economics friends tell us that this is one of the best ways to save. Because we will still have a lump sum to spend, we won’t really notice that it is not as much as it could have been. We’ll have the joy of spending while also having the benefit of saving for a rainy day. And, if you’re wondering how to decide how much to save, the Consumer Financial Protection Bureau has a tax time worksheet to help you make a savings plan. A big THANK YOU goes to our bill sponsors, Senator Jonathan Dismang and Representative Monte Hodges, for their leadership in helping Arkansans save! Sign up to receive the One Southern newsletter.